It was an amazing experience to be the guest on Dubai Today, Dubai Eye’s flagship morning chat show with host, Suzanne Radford and co-host, Richard Manson. The two-hour show was punctuated only by commercial breaks. We talked about The Thinking Tank and what inspired my story, writing, love, loss, grief, life’s crappy stuff but also life’s joys and blessings, and I was touched by the comments, empathy and stories, which flooded in from all over the UAE. But when Suzanne and I discovered an incredible link between our two lives, we both felt chills down our spine. As we chatted, we realised that we had both lived in the same village in Rutland, and that Suzanne’s family home is just around the corner from the churchyard where my elder daughter, Rowena, is buried. Suzanne had even been to a party in the same house that we lived in, years earlier when she was a girl. How extraordinary that I was there in that place so many miles from home with that link with the village that one of those closest to me will never leave. Suzanne tells me that the messages she received following the show were uplifting and positive, and that we had touched hearts and inspired some who have been following painful journeys to seek a way to move on. That is a real blessing. Meeting Suzanne is another and we plan to have coffee together next time she is in Rutland. But it would be wrong of me not to acknowledge that telling my story over the airwaves was in some way cathartic. With no idea who is listening, no particular person to talk to, that curious anonymity of being invisible allowed me just to be me and tell it as it was. How lovely when it works both ways. The chat show is quite long, but if you fancy dipping in, please click below, which takes you to the page where you’ll find the radio link below (commercial breaks have been removed) or visit my website: www.jaedewylde.com and go to the news page. 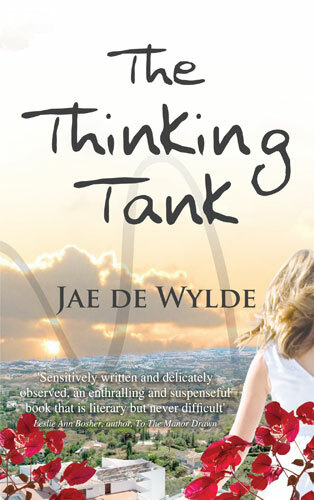 The Thinking Tank is available on Amazon in paperback & Kindle and from branches of Waterstones and Walkers.